Parkin with blue cheese, port jelly and figs. | dash.drizzle.dollop.devour. Parkin with blue cheese, port jelly and figs. I do like to have a cake on hand when I have weekend guests. The moment invariably arrives where a cup of tea and a slice of something sweet will go down nicely. Given the time of year, I thought I’d make a Parkin. I grew up having Parkin as a Bonfire night treat and only latterly did I learn that this type of cake is indigenous to Lancashire and Yorkshire and rarely eaten in other parts of England. Even my Cheshire-bred husband never had Parkin. Now I’m not going to get started on the differences between Yorkshire and Lancashire versions, all I will say is that there is something appealing about celebrating and preserving my regional heritage, even if I am now mostly feeding suspicious southerners! The best way I can describe a Parkin is a cross between a ginger cake and a flapjack. It’s imperative to make it about a week before you want to eat it, which gives the flavour time to mature and, most importantly, allows its texture to develop. It becomes denser and stickier the longer you leave it, evolving from an oaty ginger cake into something really special. I nearly always forget to bake it in time, but this year I had it in the oven a week in advance and then it sat, patiently wrapped in foil, ready for its weekend unveiling. Apart from enjoying a chunk of this with a cup of tea, I also managed to include some in our Saturday night dinner. It was a combination borne of fluke and circumstance really. I wanted a light pudding to have after supper and was leaning towards a jelly of some sort….. my sister in law happened to bring over some blue cheese…….the parkin was doing its thing in the tin….. et voila, a pudding and cheese course in one. Blue cheese and ginger is a wonderful, complex flavour combination. I’ve tried all sorts of cakes and biscuits with blue cheese over the years, it is fantastic paired with a rich fruit cake or a crisp ginger biscuit, but never before have I thought to try it with parkin. The addition of some classic port and fresh figs resulted in a combination which could be enjoyed in any which way, all four elements providing contrast and compliment to each other. First up your parkin. Please, please, please try and bake this a week in advance. Place 8oz golden syrup, 20z treacle, 4oz butter and 4oz dark brown sugar into a pan and heat gently until melted together. In a large mixing bowl add 4oz plain flour, 1tbsp baking powder, 8oz oats (I just use normal porridge oats) and 2 – 3tsp ginger, depending on how much you like ginger. Add your melted butter/syrup mix and stir thoroughly. Then mix in 1 egg and a splash of milk. Line a 20cm square tin with parchment paper and then pour in your mix. Bake at 120C for 50mins to an hour. It won’t really rise, it will just set, turning a deep golden brown with a nice sticky crust. Once cool, wrap in fresh parchment paper and a double layer of foil and leave to work its magic. This will cut into a good 16 squares. In a pan heat 300ml cranberry juice, the juice of half an orange and 65g caster sugar, stir from time to time until the sugar has dissolved. Don’t allow it to boil. In the meantime soak 15g leaf gelatine in cold water until it goes soft and floppy, just a couple of minutes. Then stir into the hot cranberry juice, until it has dissolved. Then add a further 150ml cranberry juice and 275ml port. Impatience leads me to this method – adding cold liquid now reduces the length of time it will take to set. Decant into whatever containers you choose – I used a selection of silicone moulds and ramekin dishes, for no other reason than I didn’t have anything else suitable, hence I ended up with a random assortment of little individual jellies. Leave to cool for a couple of hours till set. To unmould, dunk them briefly into a container of hot water. Count to 3 and then turn upside down and if they don’t slip out, pop them back in for another 3 seconds. Too long and they will melt! 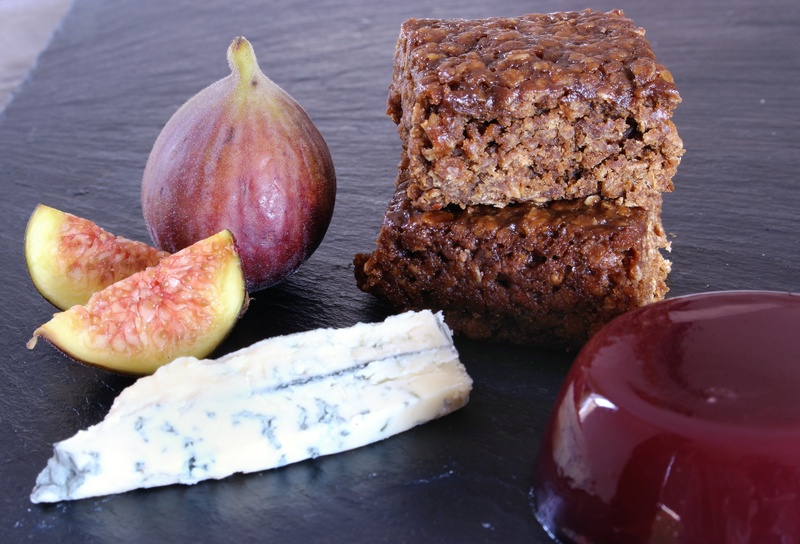 I served a little collection of jellies alongside a good slab of cashel blue, some cubes of parkin and a few figs plus extra port on the side for a pudding and cheese course in one.